Total Score: 8.75 + Editor's Choice! Introduction: Gone are the days when anglers have just one rod for each application, today many fisherman boast serious tackle collections, and on more than one occasion find themselves transporting a wealth of rods to accompany them on their fishing expeditions. 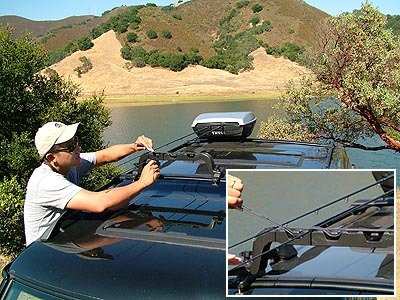 The problem is that when fishing with friends a fully loaded SUV has little room for lengthy one piece rods. 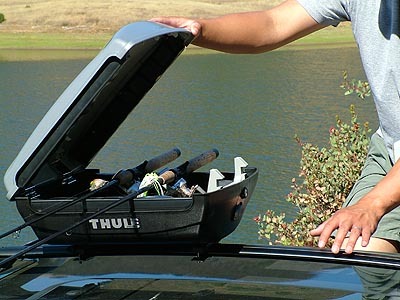 Thule, a leader in load carriers introduces the "Castaway," a cleverly designed rod rack that offers anglers a safe way to transport just about every rod and reel combo safely on top of any factory roof rack. 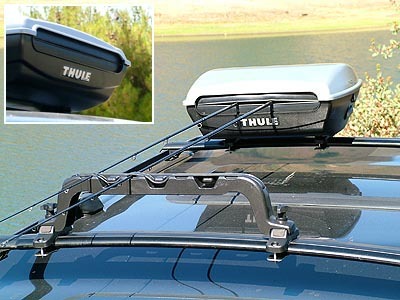 Gripper Opening Width 1 1/2"
About Thule: Thule is a world leading manufacturer of load carriers for cars, and offers a complete line of rooftop boxes, roof rails, bike carriers, trailers...and now fishing rod holders. Thule's goal is to allow sport enthusiasts and active families to transport their equipment by car when they practice their recreational and professional activities. Impressions: The Thule Castaway arrived in a medium sized brown box and was packed neatly in separate plastic bags for protection. The entire rack was lighter than we expected, but still looked solid. Upon further inspection the Castaway appeared well constructed, and the rack looked like it would be easy enough to install. Rather than stress tests the individual components we felt like it would make more sense to go through the entire installation process and put the rack to use before subjecting it to any intentional abuse. Real World Tests: Unlike other tackle tests where we just hit the lake, the Castaway required two separate series of tests. First we would go through the entire installation process and then we would load the holder with an assortment of rods to test actual functionality. We decided it was best to install the Castaway with just one person, to see just how easy the entire procedure would be for a single unaided angler. Installation: The Castaway comes with a thin instruction booklet that details the installation process with a visual step by step guide and description. 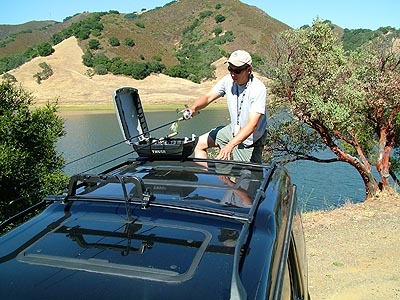 Thule includes a flexible bracket system that makes it possible to mount the Castaway on just about any factory installed or aftermarket roof rack. Installation of the rack requires just one tool, an Alan wrench, which comes with the Castaway. A tape measure can help make the installation easier but is not necessary. The mounting hardware consists of a plastic module which holds a adjustable knob used for tightening the actual rack. This is clamped onto your rack with a stainless steel bracket. The first step is to bolt these modules onto your roof rack. 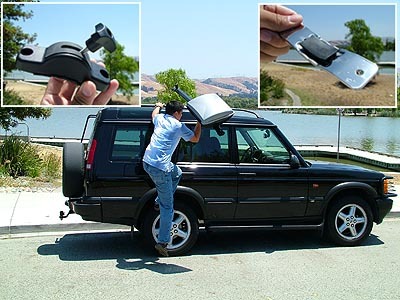 Some racks like those found on our Land Rover Discovery II are removable, and make the installation process even faster. But if your SUV's racks do not come off it is easy enough to stand on the running boards or on the inside of your open door wells. Before you put on the brackets envision which side of the car you want to mount the rack on. You want to make sure the lid opens in a direction that is easy for you to access. On our test car we had a ladder on the rear of the car so it really didn't matter. Once you are ready go ahead and position one bracket then measure the distance to the other, or you can mount both brackets loose enough so they can still slide, put the Castaway rack on top, position the rack exactly where you want it, carefully remove the box, and then proceed to tighten the bolts. Each bracket requires two bolts, and you want to be careful not to over tighten...we did so intentionally and sure enough we stripped the threads on one of our brackets. Once the four brackets are in place it takes seconds to put the Castaway back on the modules and tighten the hand bolts, effectively securing the rack to your car. The entire process was straightforward and took less than 15 minutes to complete. In fact it will take longer to wash your car than it does to mount the Castaway. Construction: Now that the Castaway was mounted on our test vehicle we ensued a gamut of tests. We took a hammer to the main box, and sure enough the shell is indeed impact resistant. If it could survive five strikes with a hammer it should have no difficulty shielding your reels from stray freeway or off-road debris. We blasted the Castaway with a high pressure washer to simulate pouring rain and while some water did get into the edges the majority of the box remained quite dry. The hinges on the box are spring loaded and constructed of stainless steel. Finally Thule implements a nice latch on the box which features two hefty plastic hooks to lock the lid down securely and evenly. Loading & Capacity: The Castaway is designed to hold just about any type of rod/reel combo. The box is deep enough to retain all but the largest conventionals, spinning gear, and fly reels. To load the Castaway simply open the lid by unlocking the unit, and depressing the large plastic button which actually pushes the entire hook assembly inwards. Because the lid is held on via the springed hinges, and places counter pressure on the hooks, the best thing to do is to slightly press down on lid as you depress the button. This not only makes it easier to open but also helps safeguard the hinge mechanism. On both side of the box are rubber lips which will stretch to make room for the protruding rod blanks and handle. We had no problem loading bass rods, big game rods, fly rods, and even surf rigs. The box bottom is padded for added reel safeguarding. Closing the box is easy enough, and you need to make sure that you get booth hooks to latch, if you press on only one side sometimes only one corner will latch. Once closed the rod tips will point upwards due to the pressure exerted from the rubber edges. This is where the tip holder comes into play. The tip holder secures each of 4 rod tips in individually padded slots. 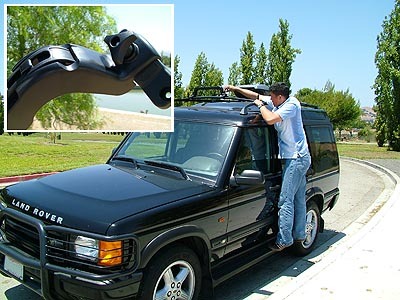 A flat rubber cable is used to secure all tips horizontal to the top of your vehicle. One Key System: Most Thule rack systems are sold without a lock, as Thule "one key system" lock cores can be ordered so your entire set of Thule products can be opened via one key. The Castaway does come with a lock and key but the core can easily be replaced with any special order Thule lock cylinder to match your existing set of keys. The Castaway comes complete with a lock because the lock actually helps ensure zero movement on the locking mechanism. During our tests the box can pop open on rough road if it is not locked, this is the reason we recommend locking the box even for short drives. Transport: Our Land Rover DII isn't exactly the most cost-effective vehicle when it comes to fuel economy. There have been times when loaded with backpacking gear there is a noticeable effect on gas mileage. Thule is an expert in aerodynamic box design and the Castaway system is quite sleek in shape, and even on a 300+ mile round trip we noticed absolutely no drop in gas mileage. When fully loaded and cruising at speeds under 25mph the box Castaway is totally silent, at around 29-32mph we began to hear a slight hiss, and upon closer inspection we found that it was actually coming from the tip holder rather than the box. Overall the tiny amount of wind noise is a minor concern, and with the windows closed it is barely audible at all. Applications: The Castaway is an useful accessory that allows anglers to carry up to four complete fishing outfits. This is especially useful when you already have a car full of passengers. The Castaway is great for anglers on long trips, and the ability to lock the rods will protect them when you are away from your vehicle. Fly fisherman now have an easy way to move from streamside locations without having to break down rods. The bottom line is easier and safer transport for your entire rod & reel outfits. Conclusion: Thule could have just modified one of their existing boxes and marketed it as a rod holder, but instead they went to the drawing board and created a brand new enterprise in rod transport. The Castaway addresses the primary concerns with rod transport in spades. Now anglers can transport their rods and reels together with an easy to install and access system, protect reels from the elements, and secure the entire combos with an integrated lock. 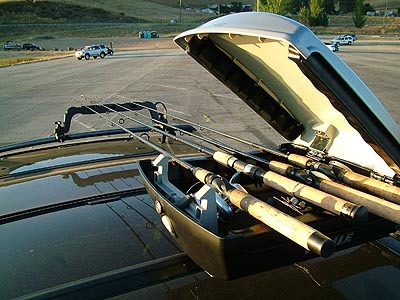 If you drive a SUV or car, and are looking for an easy and safe way to transport those pricey fish sticks the Castaway will definitely eliminate the inconvenience of having to shove all those one piece rods inside the cabin of your vehicle. 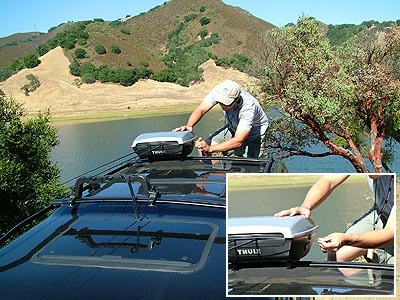 Thule has a real nice product here, and fly fisherman, offshore anglers, or bass connoisseurs can all benefit from the flexibility offered by the Castaway. It is the combination of quality construction and flexibility in application that made the Castaway a TackleTour Editor's Choice winner.